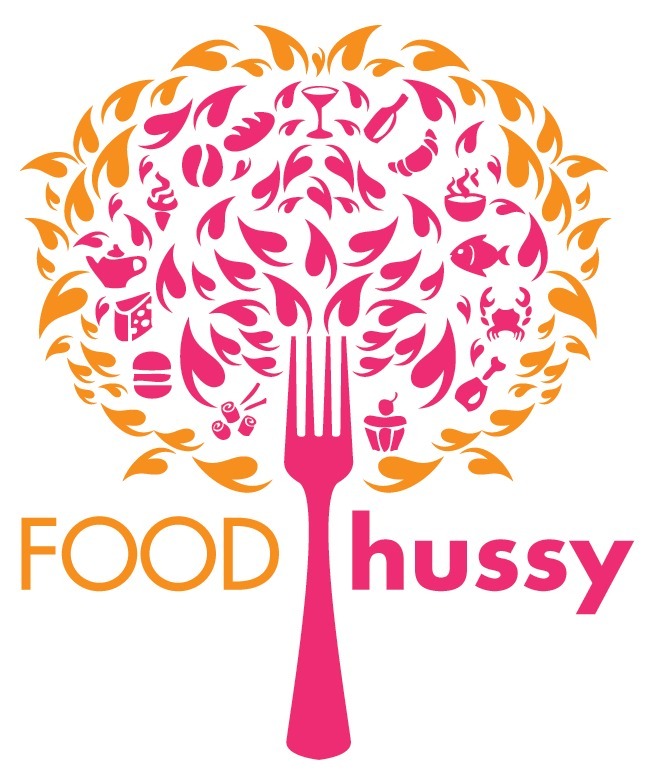 Recipe: Beef + Cheddar Party Sliders | The Food Hussy! Ok - the big game is tomorrow and you need to get ready! You know - even if you're not having a big party - you're going to be watching the game, rooting for the Rams and wishing you had some food! 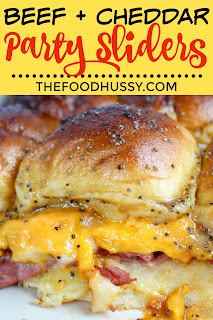 This recipe for Beef & Cheddar Party Sliders is the way to go!!! 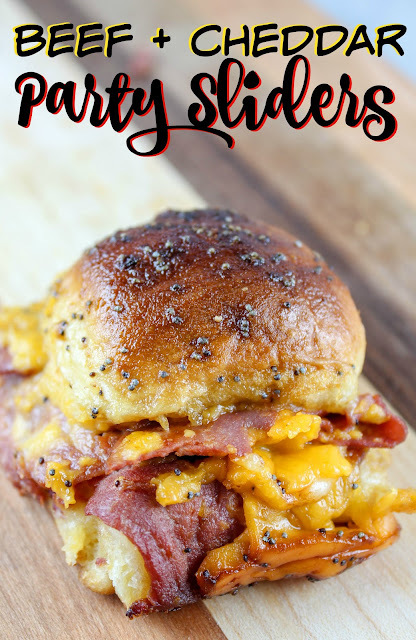 The best part of these party sliders is how quick they go together! Ten minutes and you get them in the oven - plus they have the delicious bite of my favorite secret ingredient!! Click in to find out what it is! I mean - come on!!!! 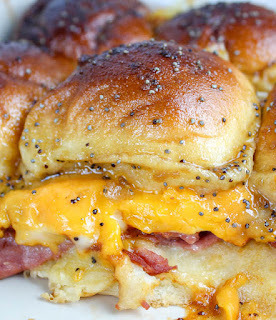 There's no way you can look at that cheesy goodness and not want to dive in!! I love the party sliders because there's this wonderful buttery Worcestershire topping that you brush on top before you bake - so every slider is even gooier! But what about that secret ingredient??? It's Woeber's Horseradish Sauce! Last fall I toured the Woeber's factory and found out even though mustard is sort of their "thing" - the Horseradish Sauce is their #1 seller and it's made right here in Ohio! 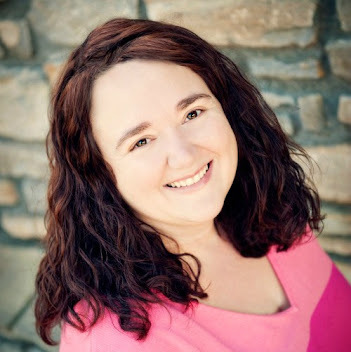 They have a great story and I love supporting Ohio companies. And DON'T be scared off by it! I'm not a fan of straight horseradish but this sauce is the perfect blend - it's got the bite of horseradish but is creamy and light. It adds so much ZING to the sliders!! It's a must-have!!! Roast beef & cheddar is such a classic combination so you know these will be loved by everyone at the game day party! (And remember March Madness isn't far off either!!) 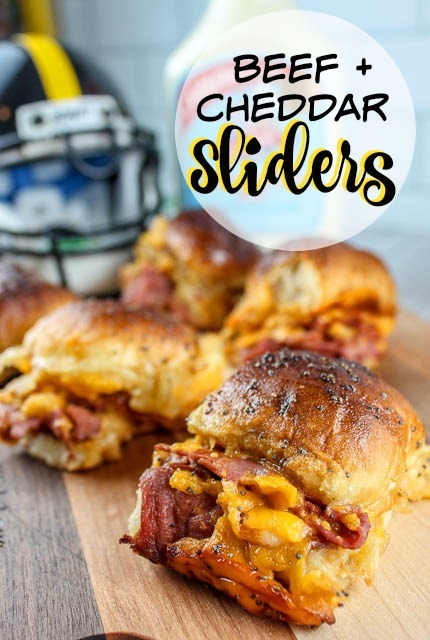 The sliders are so easy to put together - just slice the King's Hawaiian Rolls in half and add the roast beef, cheddar, horseradish sauce and bbq sauce - boom done! Top with that butter sauce and pop them in the oven and melt it all together! 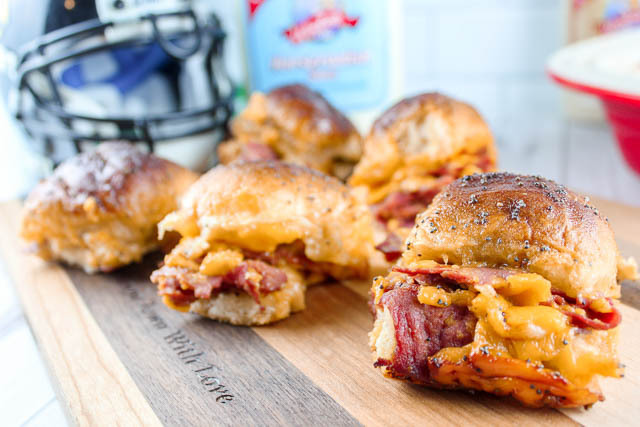 Party sliders are the best idea for a big game day - you can whip out a batch in 20 minutes and they're so fancy! Your guests will never know how easy they were! 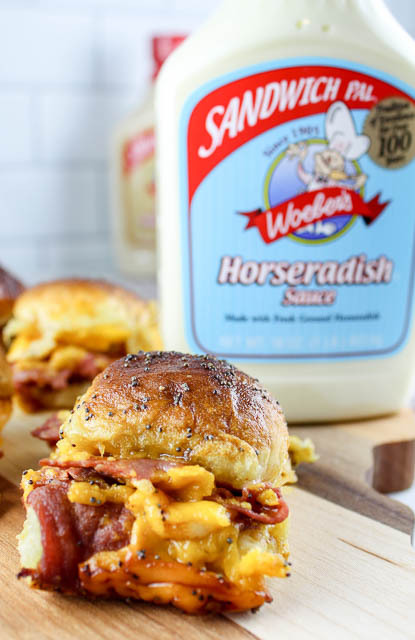 These beef & cheddar ones are made even more juicy and delicious with the bite of Woeber's Horseradish Sauce and bbq sauce. Yum! Must make these for the game tomorrow!